A few of the butterflies I saw on holiday in Wales, on the Ceredigion coast, and in gardens just inland in August. Click on any picture for a slide-show. The Grayling was a surprise – I thought I’d taken a picture of a Painted Lady until I checked it in the book. I did see Painted Ladies too, but not close up. I got quite excited about the Wall butterflies, as we don’t get them at home, and I can’t remember when I last saw one. This was the best hunting though – I had to stalk it for ages, and I wasn’t sure what it was. Then it came and sat on my leg! 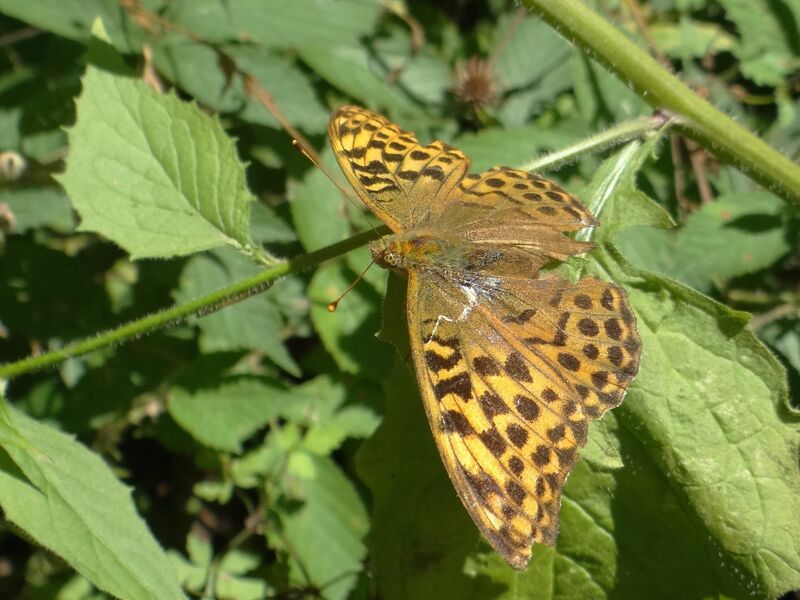 I was so flustered that all I managed were several totally out of focus shots – but then it was kind enough to sit and pose for me – a Silver-Washed Fritillary, another new one for me. Categories: biodiversity, garden, house and garden visits | Tags: biodiversity, butterfly, Castell Henllys, Ceredigion coast, coast path, comma, common blue, Cwm Cou, gatekeeper, grayling, lepidoptera, Llanerchaeron, Llangrannog, magpie moth, Mwnt, ringlet, small tortoiseshell, wall | Permalink.